FileFinder Anywhere - the leading browser-based Executive Search software powering recruiters and strategic recruitment teams around the world. Now featuring the exclusive integration with GatedTalent. Execute your projects better with FileFinder technology while complying with the uncoming GDPR legislation. Check out the photos and feedback from the event! 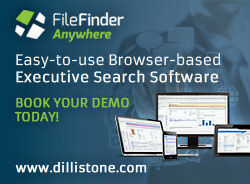 FileFinder Anywhere - Powering Executive Search. Anytime. Anywhere.